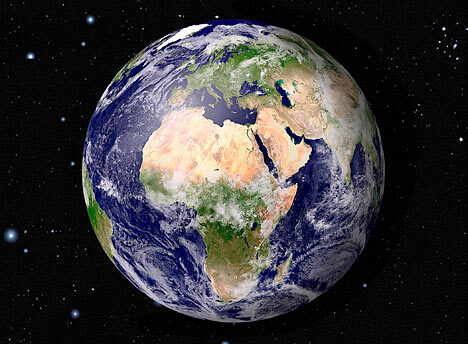 Really Rocket Science » Blog Archive » Earth Day! I’m a big Earth Day fan, maybe because it reaches back to my Wisconsin roots. In September 1969, Gaylord Nelson, a U.S. Senator from the Dairy State, proposed a nationwide demonstration focused on the environment for the following spring. Senator Nelson’s idea to put the environment on the national political agenda means that, today, Earth Day is being observed by millions of people in over 170 countries. Climatologists at the NASA Goddard Institute for Space Studies (GISS) in New York City have found that 2007 tied with 1998 for Earth’s second warmest year in a century. For proof, look no further than the fat $130 million investment scooped up by eSolar, a company whose basic solar power strategy — using sunlight-reflecting mirrors to generate steam — was all but abandoned in the 1980s, and has recently recently caught investors’ attention again. The money, from Google’s philanthropic arm, Google.org, and venture capital firms Idealab and Oak Investment Partners, will go towards the construction of eSolar’s first functioning solar power plant. This entry was posted on Tuesday, April 22nd, 2008 at 1:53 pm	and is filed under Business Network. You can follow any responses to this entry through the RSS 2.0 feed. You can leave a response, or trackback from your own site.